While moving to a new location in the Chicago suburbs or from the area to another state can be a exciting experience, it can also be a demanding time full of endless, mind-boggling tasks. From selecting a professional moving company to preparing your belongings for transport, you can have a hassle-free move if you plan accordingly—particularly if appliance moving is on your lists of tasks. Appliances can easily be damaged if they are not prepared correctly in advance of your move. To help ensure that your appliances are ready for your upcoming move, the experts at Boyer-Rosene have compiled some helpful tips for preparing heavy, bulky refrigerators and washers and dryers so they are ready to transport when moving day arrives. Since you’ll need to remove everything from both the refrigerator and freezer, its best to begin preparing for this step a few days—or even a week—in advance to keep from throwing out too much food. You can reduce the amount of food in your refrigerator by creating meal plans based on what you currently have and finding friends, family members, or a charitable organization that will take your remaining food items. Don’t forget to remove ice cube trays and magnets as well. It is best to take out all of your shelves, drawers, organizers and any other removable components and pack them separately in preparation for your move. If your drawers are fairly secure, you can tape them closed rather than removing them completely to save on valuable packing space. Then, clean and dry your refrigerator thoroughly and defrost your freezer to avoid water leakage during your move. Unplug your refrigerator from its power source, wrap the cord into a small bundle and tape it to the back of your fridge to prevent it from being damaged while in transit. If you have ice maker or water filter, disconnect those accessories as well according to your appliances owner’s manual. Like your refrigerator, your washer and dryer are important fixtures that you may want take with when you move. The process for preparing these items is a bit more extensive, and may require the assistance of a qualified technician—particularly if you have a gas dryer. Several days before your move, run your washer through the rinse cycle and leave the door open for at least 24 hours to dry. This will prevent the growth of mold or mildew during your move. 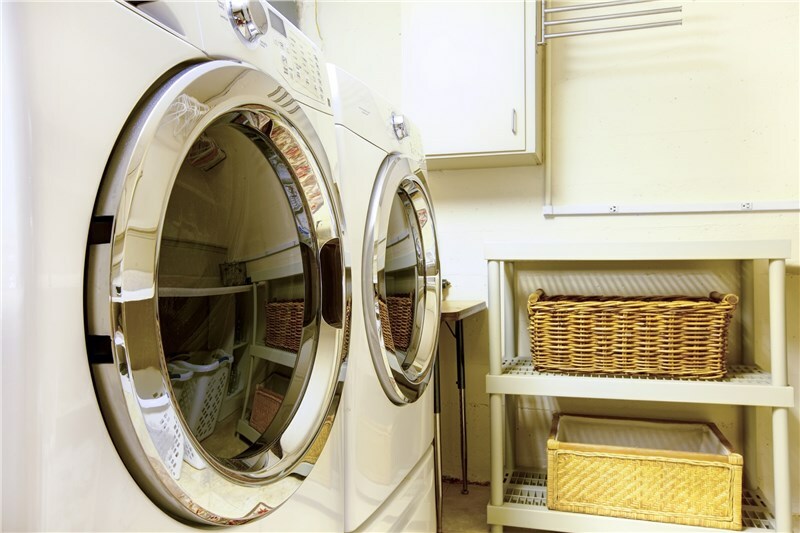 Before you simply unplug your washer and dryer, it’s important to shut off the power at your electrical panel. If you don’t know which breakers lead to your washer and dryer, shut off the power to your entire house—don’t take unnecessary chances! Once the power is off, unplug your appliances from the wall outlets and tape the power cords to back of each appliance. Shut off the water supply to your washer and use a wrench to disconnect the water hoses from the wall. Allow the hoses to air dry, then put them in a plastic bag and place them inside the washer or pack them separately to ensure they don’t get lost. If your dryer runs on gas, shut off the gas and disconnect the gas line from the dryer. This step is best left to a professional plumber if you aren’t experienced with this process. Before attempting to move your dryer out from the wall, disconnect the solid or flexible dryer vent pipes. You can pack them in a bag and put them inside the dryer or put them in a separate box—as long as they don’t get lost! Washers and dryers often came with bolts or moving pins to secure the drums during transport. If so, use them to keep your drums from moving or check your owner’s manual for other recommendations for securing the drums. While most moving companies will not disconnect your appliances prior to your move, a professional residential mover will take care of wrapping, loading, and securing them in the moving truck. If you’ve followed the above steps–or enlisted the services of a qualified technician—your appliances will be ready come moving day! Do you need an appliance mover for your upcoming move? Boyer-Rosene serves residents of the Chicago suburbs with the best comprehensive moving plans in the region! Give us a call today to discuss your needs, or fill out our simple online form now to request a free moving quote.